- Removed "Update server list when connecting to a server"
- Removed "Update server list when a client connects"
The utility replaces the signature and ident issue for any sign from the list. - EXEForger - New name. UPX is a free, portable, extendable, high-performance executable packer for several different executable formats. It achieves an excellent compression ratio and offers very fast decompression. Your executables suffer no memory overhead or other drawbacks for most of the formats supported, because of in-place decompression. UPX 3.05 has been released. one page. New compress-time option --unmap-all-pages is available. because upx does not understand enough about .dylib. - Improved Opera favicon cleaning by only deleting non-bookmarked entries. - Detailed view can now be set as default in Advanced options. - Added support to save Startup items to a text file. - Added new INI variable for Local Low folder %locallowappdata%. - Improved OpenOffice 3.x support. - Improved Quicktime player cache cleaning when in Protected Mode. - Fixed bug where Summary panel text could be edited. - Fixed bug in Uninstall Tool for Windows 2008 R2. - GUI improvements to Cookie screen. - Include/Exclude screen sorts entries in alphabetical order. - Number formatting is more accurate in Cleaner results. A P2P application for sharing files using the popular BitTorrent protocol. Through Torrent Download Torrent users can get a great speed of delivery, up to 100 megabytes, and may even share files larger than a 1 GB. * add compatibility for windows 7 on manifest. see MSDN-Application Manifest. But, if you use some plugins (e.g. Flash), Fx run under VISTA compatibility mode. VS 2008 Pro SP1/SSE2+PGU build ver. VS 2008 Pro SP1/SSE2+PGU build installer ver. A CLEANINSTALL is very important ! I want to thank Tuxman for the Mod and say sorry for the early beba 2.60 beta introduction. eMule IS mod for IS74's EDonkey2000 network. Here comes a new version of RDesc added two more servers in this version — egoshare and 2shared. - Added new account free: zshare. A new auto-update version comes to 2.30. With this new update is available solves the past problems with the servers. Specifically the error is fixed letitbit hotfile and that by you could not download them. With this update we can continue downloading without problem from these servers. 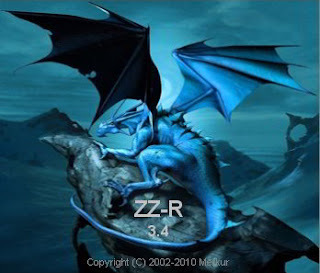 Download this file (http://rdesc.com/rdhost/RDHost_2.30.5.zip) and unzip into the folder RDesc, when asked replace the old file. * Windows 2000 and later recommended. * Recommend changing the value of "general.useragent.extra.firefox" from "Namoroka/…" and other strings to "Firefox/…", and some sites and add-ons will work properly. * If you execute 'Module binder for Private Build' and finish modules binding, Firefox may be started faster. * An incompatible nssckbi.dll installed in a different directory can impede the startup of a new build. If so, please rename the old nssckbi.dll temporarily before trying to run the new build. * Applied Miyasaka's "IJG's JPEG software with x86 SIMD extension V.1.02". * Added patches into a Source folder. * Made libpixman and libtheora into DLL to make it easier to test. Hier noch - auch um die Wartezeit bis zu einer Version auf v0.50a etwas zu verkürzen - eine Beta auf eMule v0.49c. Diese Version enthält nur Fixes und keinerlei Neuerungen. Somit brauchen im Grund nur diejenigen updaten, die Probleme mit AJ v3.2 haben. Alle anderen können warten bis zu der Version auf v0.50a. Desswegen wird diese Version auch nicht im Forum released und nicht auf der Applejuice Homepage. 1. Disable java, pictures and flash on websites by using prefbar. 2. Ad-blocker for example system wide Ad Muncher save some traffic. 3. Using Google mobile to view pages (images are compressed like in opera with turbo). 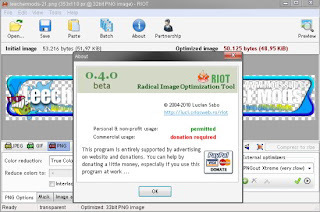 Riot 0.4.0 - Radical Image Optimization Tool - A must have tool! „Radical Image Optimization Tool (RIOT for short) is a free image optimizer that will let you to visually adjust compression parameters while keeping minimum filesize. RIOT is a must have tool not only for webmasters, forum and blogs to speed up page load time by reducing graphic image file sizes (website design themes, screenshots, etc...). Software developer can check their embedded graphics in applications if optimization is possible to reduce overall filesize without or with a minimum quality lose. However already small graphics below 1/2kb can be checked with Smush.it if further optimization is possible. By GIF's optimization you may have a look to SuperGIF. * Added Tete's patches into a Source folder. +CHANGED: PowerShare restrictions for partfile or finished files to 800 src.